Baking and decorating an elaborate wedding cake step by step is just like building a website with SBI! version 2.0. Building from a strong base, supporting the tiers through pillars of strength and adding satellite cakes all around the center is the perfect analogy. 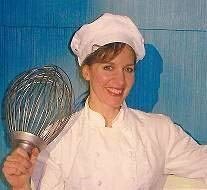 Hi My name is Lorelie and I am a pastry chef who has been baking and adorning wedding cakes for over 25 years. I started a wedding cake website using the Site Build It! program in July 2009. Because of SBI! I get a rush everyday as new people add wonderful content for me. Running a cake decorating contest and answering wedding cake questions on my Wedding Cakes For You website is an integral part of strengthening the site. It has helped my readers to gain trust and recognize me as an authority on wedding cakes. The stream of income and people coming to my website gets larger each month as my followers continue to build great content for me through SBI! Version 2.0. Time spent answering people's questions is an investment in the sweet success of Wedding Cakes For You. It helps the search engines find my site for questions that people search everyday. SBI! is also helping me to gain new wedding cake clients for my offline baking and decorating business. If you have a passion for something it's not difficult to build an SBI! website. It is work but it's not drudgery when you love whatever it is you are sharing. Having a company like SBI! backing me and fellow SBI!ers helping any time on anything is an incredible experience.